A few hours ago I opened up my new 320GB hard drive and used Seagate's fancy software to clone and replace the drive. To my surprise it went very quickly and Vista started right up! Then... Vista decided to do what it does best and say my product key was no longer valid because it was used on another computer. It gave me a nice message saying I had three days to activate. My choices were to buy a new key, enter a new key, or contact Microsoft. So, I clicked the phone option, rattled off 9 groups of 6 digits, twice, once to a computer and once to a human, and then another 9 groups of 6 digits were rattled back at me. Click the next button and problem solved! From what I've heard, apparently this typically happens after you change out lots of hard ware. Apparently a new hard drive counts! Probably the most common, if just most talked about, trigger is swapping out graphics cards every other month. Since I at least attempt to blog about my technical problems this seemed perfect. Overall I'm very happy, if not surprised, at how fast and easy it was to resolve this problem. "There were no sounds of stirring save the click of a mouse." I guess I'm just having a good break... This is the first story that I've submitted to Digg that has be "homepaged". I was on XKCD at midnight and noticed no one submitted the new comic yet, so I went over to Digg, typed in a title and description. When I woke up the story had over 680 Diggs and was on the homepage! So far I'm having a great holiday break! I'm running out of geeky things to accomplish for the first time... Yay Digg! I've been a long time webmail user. Back when I first started using email, it was probably around the 5 grade when I got my first email account, it was my Yahoo! account. I still use it today. Back then, POP3 access from Yahoo! was free. Since the Internet wasn't as omnipresent as it was today, I used Outlook Express. Being the geek I was, it wasn't bad. However, disaster struck as our hard drive crashed and I lost all of my emails! Silly me, I didn't keep them on the Yahoo servers (which has something like 5MB of storage). Luckily, as I really didn't have any important emails I learned a hard lesson with not very significant consequences. I kept using Yahoo! Mail but stuck with the web based access. I didn't like deleting messages because I am just a computer packrat. Bits and bytes don't really hurt anyone (for the most part) if you keep them. Often, old emails can prove very useful. As a result I ended up upgrading to Yahoo! Mail Plus when I went to High School. It was quite useful to have the added features. A premium member received additional filters, which I was a heavy user of. 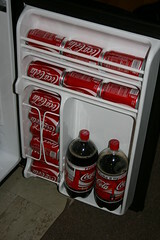 Also, additional storage which I was more than happy to use. However, this is a moot point now as storage is "unlimited." Even never deleting emails I wasn't able to even get close to using 2 GB. Other features they boasted were improved SPAM management! Back in the day, I think Yahoo! did a good job with SPAM, but my recent experience is that such a large amount of SPAM is getting through, switching to Gmail really relieved some of the annoyances with email that were slowly building. Now that I'm done telling my history with email, I'll get to my actual point. I really love having an application based email client. In my case, I use Outlook 2007. Why Outlook 07? Well, I get it free from Speed School so cost isn't a question. As for functionality I absolutely depend on the Calendar and Tasks features which I find second to none. All of my classes, meetings, and homework assignments are all neatly organized and color coded. It takes a large amount of time to maintain but it keeps me on task. It is what works for me. As a result, I always have Outlook open on my laptop. Mainly to be able to quickly glance at for my calendar and tasks. With a simple touch of the tablet pen I can mark things as complete or drag things around during class if the professor decided to announce any changes. However, when I used Yahoo! Mail, I wasn't willing to use POP3 to move my email into Outlook. POP3 results in segmented management of email. I would be dependent on my laptop for email. Even though my laptop is never far from arms reach, web based email shouldn't be dependent on anything but the Internet. What is my solution... abandon Yahoo! Mail and move over to Gmail. I have just finished tweaking the IMAP settings for my new Gmail account in both my laptop and my fairly new desktop. Now, when I have Outlook open, I get email notifications, and I can read and reply to email without opening a web browser. To make things even better, everything remains the same if I were to just log into Gmail in a browser. I do realize that there are Gmail notification programs and other ways of doing things, but I'm already using Outlook! Also, there is just something about having emails in an application like Outlook that is satisfying. I won't be able to use Outlook and my email more tightly with other Office applications until the new semester starts but I think that will also prove to be a time saver. Things like being able to send files and Office documents without launching a browser may prove to be the best way of dealing with things. I'm also curious if Outlook is easier/faster in dealing with attaching and downloading files to emails. While I haven't found a good way to deal with my contacts, I am satisfied with my decision to move over to Gmail. I currently do not wish to mess with Google Calendar in so far as I'll subscribe to ones I need in Outlook 2007, but nothing more than that for the time being. I have one last lingering problem that I need to sort out. 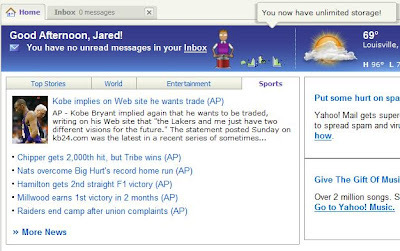 I am afraid of completely abandoning my Yahoo! Mail account as I have used it for such a long time and have so many things tied to it. For me to keep POP3 access I would have to pay $20 for a year of service. My account goes up for renewal in January and I may end up paying just to keep that account funneling into my new Gmail box just for safety. After a year it would probably be safe to finally pull the plug and let the account drift off into the distant corner of the Internet. If I don't renew, I would be forced to log into Yahoo to check the account every so often. While my ramblings about email may not be the most exciting thing, I will try to follow up with a post on useful things I have learned and actually found very difficult to configure. While the answer to many of my problems were posted on the Internet, it took quite a bit of searching to find the good answers. Hopefully I can link to them in a future post and help get them a bump. I have long been a holdout in moving all of my email over to Gmail. I have finally done it. Well, started the process. I've managed to move a few thousand old emails into Gmail from my Yahoo Plus account using POP3. 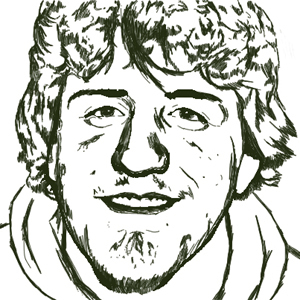 So far it has been very painless although a slow process. I probably should explain why I finally decided to make the move. I have a feeling a few people are going to gloat a little because I was so persistent with my not moving to the bliss that is Gmail. First off, I am about to have my Yahoo Plus account expire. I have until the end of December and then I will have to pay the anual $20 fee. For that price I get an enhanced spam filter (that doesn't work well... my next point), no adds, and some added features (like POP3 access and additional filters). Since I don't really want to pay the extra money, and I am not a fan of normal old Yahoo mail, moving to another platform had one point to its advantage. Secondly, I've been getting spam! Lots and lots of spam. And my Yahoo account isn't slowing down. Now, this isn't a ton of spam. Probably about 25 messages a day, and since I check my email about 10 times a day it is only a few here and there. The problem is, it is consistent. Also, it is very obvious spam. I've even had some false positives on my spam filter that I had to hunt down. That isn't an easy task when your filter blocks over 2000 messages a week! Lastly, and most influential in my decision, is the free IMAP. Well, I don't have a iPhone (and don't even want one!) but I am a very heavy user of Outlook 2007. I have long used it for my calendar and tasks. I keep it very organized and use all of its advanced features. (FYI: I'm not moving to Google calendar yet, although I can import others into my Outlook very easily.) With IMAP I can have my email on my laptop and desktop in an application based environment. Also, I have long been a fan of not having email tied to one desktop and since everything is on the Google servers, I can just use Gmail as is when I am not using Outlook. Other considerations were mainly that absolutely everyone (maybe wrong here, but then again) uses Gmail. While I probably could have moved over to Gmail earlier, I guess it is good that I waited. Gmail now offers a clear advantage over the competition. As Google continues to add features I only see myself becoming more dependent on the Googleplex, just like everyone else. If you are reading this on Facebook, I left a comment with my new address... if you are reading this on my blog... no luck on getting my new address (I'm talking to you, spammers!). I still am not happy with how my school email is being treated when I forward it go Gmail. I'll have to work out those issues here soon. My other big task is updating my account information, mainly email address, on the dozens of websites that I use. Well, at least the ones I still care about. I have a feeling that I'll be forced to check my Yahoo email for a while but I will probably end up setting up an automatic reply saying I don't answer emails to that address anymore. The problem with Yahoo is you can't forward or have POP3 access using the free version. I guess that wraps up my Gmail blog entry. I haven't had the opportunity to use it much yet. However, from what I have used so far, I do like it. I've made it! Well, almost... I have two exams on this upcoming Monday standing between me and the break. However, unlike many of my other Speed classmates, I won't be going on co-op next semester. I'll be back next semester busy as ever. This semester was challenging but it looks like my grades turned out to be not half bad. With the upcoming break I might be able to post some more about projects I've managed to sneak in throughout the semester. Last week I fell ill and wasn't even able to make it to classes. Well... I just got back in town, go to power up my "server" and discover that it is blue-screening on boot! The problem is a hardware based. It really makes me sad because I don't have the time to solve this problem now. I'll attempt to work something out later this week. The worst part is that it has two 250GB hard drives raided together in it. A ton of my data is on that box. I'm almost 100% certain that I didn't lose anything. The only major glitch it getting the data off of there if I need to reformat. I might end up buying or borrowing an external enclosure to check to see if my data is still intact. 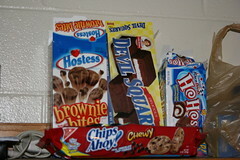 As for fixing the actual problem, I'll have to make some major decisions. I might just retire the hardware and use the other PIII I have in my dorm room (this one runs Windows XP though). The only thing I need to connect still is my printer. I'll save that task for later tonight. I'm very excited that I'll be getting a working Vista USB Bluetooth adapter. My roommate actually purchased it and it does work with Vista, unlike my Motorola Bluetooth adapter. An added bonus is that the driver is actually Windows Vista certified so none of those scary driver dialogue boxes that ask for you to continue. I purchased it from newegg. It actually wasn't that expensive. I already have it set up on my computer (I used my roommates to try it out and it worked great). The specific adapter was the TRENDnet TBW-105UB USB 2.0 Compact Bluetooth Adapter. The specific reason I wanted a Bluetooth adapter was to use my Stereo Motorola Bluetooth Headset. It is great for listening to music, plus, since it has a built in microphone I can voice chat with it too! Now I'm a big fan of text messaging. Ironically, the large majority of my text messages don't come from humans. I currently receive most of my text messages from two sources. I do text other people, but not very often. Most of my messages come from computers. The first source is US Bank. Whenever a transaction on my account occurs over $10 I am notified. This is really helpful to track purchases and detect fraud early. The other source is Facebook. Now, these messages do come from people but they didn't actually send them to my phone. The fun part about this is when someone writes on my wall or sends me a message I typically can respond within minutes by logging onto my computer or just responding to the text. I tend to confuse my friends because they think I'm constantly on Facebook. These messages help make Facebook a seamless form of communication. From what I can tell they have contracted a third party company called Get Rave. The service simply allows school administrators to send out bulk text messages to those students who opt into the program. Registration was very simple, my student username and password was already linked to the system. I simply entered my name and phone number followed by a verification number that was sent to my phone. From a student's standpoint this system will be very beneficial. During the spring semester several bomb threats were phoned and emailed to UofL and helped prompt this type of system to be put into place. Additionally, emails will be sent with the same emergency information to any specified email address. However, in emergency situations, checking an email address isn't always the fastest mode of communication. Hopefully this system will never need to be used but I can say I feel a little safer knowing that I'll be alerted as fast as possible should there be an emergency. Great summary of everything that changed with the iPods. I just found this on Digg... Basically it is a bunch of Legos that build tiny Lego cars. Yes, that is correct, they are building, one for every man woman and child in Zion. Now that sounds like a robots thinking to me. I need to give credit to Alex for saying something along these lines before I did, but I couldn't help but blog this. We were watching the new episode of Eureka that just aired today in my dorm room, and we were analyzing the episode where space junk is falling from the sky. This was the episode that aired right before the new episode. Simply put, the science in this episode is just crazy. First off, you can't really repel metal using a magnet, it has a tendency to attract. This totally negates the final resolution of the plot. Also, the sudden realization that helped some of the main characters solve the problem with generating enough power was the difference between parallel and series circuits. There is also a mention of PV cells (photo voltaic) and they are definitely indoors where there isn't very much sunlight. Back to my main point, Eureka is still a great show, but their science has slipped a little bit. The engineering classes I've taken just make some of the things they say just comical. They have nothing to do with the science. Not to bash business majors, but as a geek, if I took fewer physics classes I'd probably enjoy the show a bit more. I just finished upgrading from Windows Vista Business to Windows Vista Ultimate on my tablet. I purchased the very affordable, $8 copy from the IT store today. It is specifically for Speed School students and is at a reduced price because of our technology fee. The install took about 2 hours. It was an upgrade, I'm certain a fresh install would not have taken as long to install the OS but in the long run, I didn't want to reinstall all of my applications again. After the upgrade I was getting several very scary error messages and driver problems. Slowly things started to repair themselves and after installing all of the windows updates, things seem to be in good shape. I haven't had time yet to play with the exclusive Ultimate features, but I'll get around to it. I'm most excited about the media features that are typically in Home Premium but missing from Business. Specifically, the media center for Vista may prove to be quite useful. Lately a large amount of my friends have been installing Vista. I'm seeing a big move towards the new OS. It might be because of the fact it is almost free, but none the less, it is still worth using. Although it has some problems, as a whole, it is as reliable and useful as Windows XP when it was first released. Today I was having trouble logging onto Skype on my desktop and though nothing of the problem. Then, when I turned on my laptop and found it to not be working there as well I became suspicious. My first though was that there was some problem with my ISP but I was able to browse the Internet normally so that was not proving to be the problem. After browsing Skype.com I was able to track down the problem to a major outage that will last from 12-24 hours. This is very out of character for Skype as in my previous experiences I was able to connect to Skype even when the most limited Internet access was available. The Skype post about the problem indicates it is a software problem and they are working quickly to resolve it. Apparently they work faster than I can blog because now Skype is now logged in. Hopefully it lasts. I never wanted an all in one scanner/printer/copier for college. I always wanted a laser printer, which are cheaper in the long run. However, I often found myself in the situation where I needed to scan in, and even on rare occasions copy documents, but I didn't want a bulky costly all in one. My old, old, old scanner, an HP ScanJet 4200 just retired to the great computer junk pile in the garage and a new scanner will grace my dorm room next week. My extent of shopping consisted of looking at several online retailers that sold scanners, realizing they all cost more than I wanted to spend, then going to Staples and buying the cheapest one in the store. I will admit, it wasn't the most informed purchase I've ever made but I'm satisfied with it. I purchased a Canon CanoScan LiDE 70 - flatbed scanner (I even reviewed it on CNET and you can see my review here). My biggest decision was between a single document feed scanner and a flatbed scanner. I went with the flatbed because I sometimes end of copying and scanning out of books and I wanted to leave that possibility open. Now for the reasons I really like this scanner. This scanner is different from older technology in that it uses LEDS as a light source. As a result it uses a fraction of the power of older scanners. This technology is the LiDE part of the scanner name. Since it uses less power it can run off of a USB cable. This scanner is also very compact. One of the problems I face with my old scanner was storage and cords. My new scanner will store upright and take up a fraction of the room. An additional bonus is this one will run on Vista. My pervious scanner was too old and will never have any Vista compatibility and I was forced to do all of my scanning from my desktop. While I've not really scanned many things yet, I'm excited that I'll now be able to scan materials from my classes directly into OneNote 2007. Scanning paper documents distributed in classes allows me to have everything with me at all times by having it stored on my Tablet PC. This scanner will hopefully make that process a little easier. Last night Cassie sent me a new profile picture. 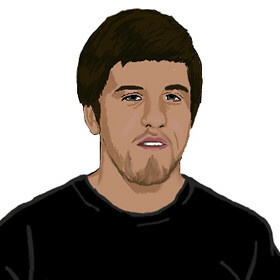 I've updated it in about 10 different places (Including my blog) where I can have a user icon. It is a different artistic style than my last one. I really like the change. My previous one wasn't bad but change keeps things fresh. The parody of the video is far better than the actual one. The voiceover is really funny. I probably will end up getting this game. Hopefully it actually works and I can get into shape! It seemed only appropriate for a computer geek to Digg his own blog as his 1,000th digg. I have been just below 1,000 keeping a close eye on my counter for the past few days. Today, I have finally reached a momentous milestone. While I doubt this is news for other people, it seems that I have become very accustomed to getting my news from Digg. More and more of my friends, even the non computer geeks, are getting their news from Digg. I have found it is especially useful at making small talk when there is nothing to do. Having very popular stories of the day as conversation topics has become common place in my life. It is truly amazing. Obviously nothing major is going to happen because I have now accumulated exactly 1,000 Diggs. However, I expect it to take far less time for me to reach the 2,000 mark as I have slowly increased the amount that I have dugg over a year. Lastly, thank you Digg for a great year of news! I was just accepted to the Pownce beta. It isn't really useful yet because I have no friends on it yet, but I'll be playing with it and see if it is worth using. It seems to overlap many features already offered by Facebook so it doesn't seem particularly useful to me yet. It seems like a good idea, but I'm yet to be impressed. However, I am surprised at the speed in which I was invited because I didn't apply until after it was announced for at least a few hours. Maybe it will not be as popular as they once hoped. However, I'll give it a fair shot and give it some type of review. I gave in, yesterday I finished reinstalling Windows Vista. I didn't have my new copy of Ultimate so I just reinstalled Business and I'll upgrade to Ultimate when I get my copy. So far I've been happy with the reinstall because I no longer get bluescreens and I can install drivers without crazy problems (see my previous post). I plan on reinstalling Vista really soon because of some of the problems it is giving me. First off, and probably most annoying, any Adobe product will not function properly including Acrobat Reader. It is quite annoying when I have to open a PDF document because I can only get it to work following a very specific process. Next on the annoying list is my driver problems. Mainly, Vista will not auto locate any of the drivers. Basically, what it does is prompt for a location of where to find the driver every time, even if it has the driver. This was the case for my digital camera, which made things very confusing. 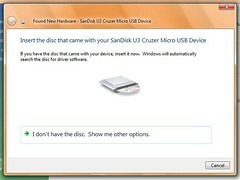 Also, ever single flash drive I put into my computer takes over 2 minutes to install, where on other Vista computers they are functional in a few seconds. Here is what happens when I install a new device. First it brings me to this screen like it doesn't know what driver to use. It should just start installing the device automatically. At this step I click the "Locate and install..."
Next, I am prompted to have a disk, which I don't have. 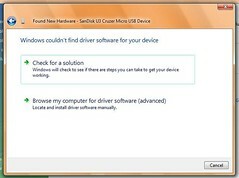 Actually, there is no other driver I can use in this case except the built in driver provided by Microsoft. Then, I'm given two choices. 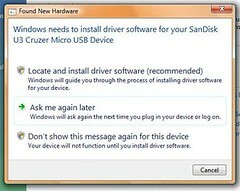 The first gives no help because Vista assumes that the driver for the device is already on your computer. To compound the problem, the above steps are typically required to be followed multiple times because most devices use multiple drivers. I haven't geeked out in a long time so I decided it was time for a new project. I don't have any pressing homework (due tomorrow, this weekend will be awful) so I decided to get XP up on my laptop. It really wasn't all that difficult. I simply obtained a legal version of Windows XP professional and then downloaded Windows Virtual PC 2007. Luckily, Virtual PC 2007 is a free download and works under Vista Business edition. The install was painless, but the fact I'm performing this on a laptop, I don't have the raw power that would make things go 100% smoothly. I'm currently working on patching Windows and I'm not sure what I'll do with it once I get it up to date yet. I know I want to get a version of Windows 98 virtualized (just for fun). And maybe a Linux distro or two. I'll probably post more when I get some more free time. My initial impressions are that everything seems to slow down when I have the virtual computer running. I'm glad our our country has its priorities straight and Paris Hilton is more important than health care. Of course I'm talking about how Moore was bumped off of Larry King to make room for the newly released Hilton. As for this clip, it was interesting to hear Moore talk candidly about his movie. There are now only five more full weeks of summer semester before I start my summer break. Speed school really takes it out of you. Hopefully, I'll be able to accomplish some stuff in between semesters. 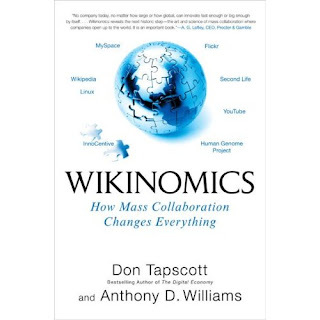 I started to read Wikinomics at the beginning of the semester but I just haven't found the time to make any progress. I really like the subject of the book because it is along the same lines as what I want to do with the rest of my life (and my college degree when I finally get it). Also, during the break I want to do some type of mod. The last big thin I did was build my arcade. That will be almost one year ago after this semester. Maybe a little less. I might do a brainstorm post about the possible things I could make. One of the things I have in mind is to build a Digg button. It wouldn't be that complicated and I would probably learn some things by doing it. Also, it wouldn't cost that much money. I'll probably have a tight budget for whatever I decided to do, but at least I'll have something to play with. I will also spend some time with Cassie when I get back. We don't get to see each other very much, about once a week tops. I also have quite a long list of movies that I still want to see. Maybe I can catch up on that too. I know the break is going to go extremely fast and before I know it I'll be back here for fall semester. I never found any reason in particular to like Michael More as a director. I have never seen any of his movies until I decided that I wanted to watch his newest, Sicko. I didn't expect to like it, I have come away from it with a new view on many issues. It is difficult to put into words how persuasive the movie truly is. The message is a simple question: why do we pay for health care? I'm going to ruin it for those that haven't seen it, but that doesn't matter. Everyone needs to get the message, no matter how it is delivered. The movie starts by looking at people in the US who needed medical help and how their treatment revolves around money, not the care they need. It then focuses on the quality of care in Canada, England, France, and finally Cuba. It is incredible how backward the US seems in comparison to ALL of these countries. Did you know in France, if a mother needs help doing laundry the government will PAY to have someone do it for you! Also, in all of the above listed countries (and probably more) there is next to no charge for any health services provided, including medication. In England, doctors are paid based on how healthy their patients are. That is the important message to get away from the movie. Simply put, the US NEEDS to move to a socialized medical system. The current system is based on monetary profit. The problem is, we won't, at least any time soon. The reasons for that get into political arguments which I would rather avoid. I was actually surprised by the lack of "Bush bashing" that took place in the movie. I expected quite a bit more, but based off of the comparison of me not having saw any of More's other movies, this was the most subdued with regard to political agendas. The reason for that is that health care is not a political issue, it is a moral one. Everyone who needs health services should have them provided. I truly believe in that. I am so absorbed in my own life (like many Americans - well... not even Americans because those in Canada get free health care) I don't know how to help promote any change. I normally don't blog about this like this but sometimes I just get the urge to make my opinion known. I don't know what to do other than blog about this topic. I've never cast a vote in my life, although I'm now a registered Democrat (that is still weird for me to say). I do know that I strongly support socialized medicine. Hopefully there comes a point where I can make a difference. I hope in some way this movie affects people to make it known that things need to change. Maybe a change will happen. I don't know. I know many people will be skeptical about watching this movie, but I can definitively say it is worth watching. Is the iPhone worth supporting the evil AT&T empire? The iPhone is super-hyped, but is it worth getting if it means giving money to the privacy-hating, monopoly-having bastards at AT&T? Gizmodo examines why it might be worth skipping the iPhone to maintain a clear conscience. I've been using Live writer for a very short time, but I feel that I have posted enough to actually write something of a review about it. In short, I like it. I is a stable and useful way to create blog entries. I especially was satisfied when I realized the many different useful plug-ins that were available. I have currently installed a grand total of 3. First, the DiggThis plug-in that allows an easy addition of a Digg button to a post. Next, I added the Ink Blogging plug-in, although I doubt I'll ever use it. I just added it because I have a tablet. Last, and most useful, I added a Flickr Image inserter. The Flickr plug-in will probably be the most useful. I'm able to search Flickr, including my personal pictures, and insert them without having to make a big deal of copying and pasting the correct size picture and everything. It will save some time when it comes to posting. The only down side is there is no way to automatically upload imported pictures to anything other than an FTP server. I'm not sure if it is because I have a slight drop in the amount of homework right now, but I have been blogging more since I started using Live Writer. I really like how I'm not forced to go to Blogger and log in and start writing. Launching an application is faster and it more convenient. I am glad there is a useful integrated Spell Checker. I would only blog in Firefox specifically because it had an integrated spell check. Other features I like are the automatic draft saving. I turned the frequency up to 1 minute just so I won't lose any of my hard work. I also was excited (and am testing out in this post) the built in PING feature. So far I've added FeedBurner and Technorati, but I might have a few more places to PING as as well. I haven't found any quirks that annoy me enough to mention. I am still a little confused on how to edit old posts, but that is because I am not familiar with that feature yet. The categories tool is much more powerful than any web based interface I have seen. I'll continue to use Windows Live Writer for all of my blogging. On an interesting but unimportant side note, unlike Blogger, the time that the Publish button is clicked is when the post is published (time stamp wise), rather than when it was first started. Hopefully Live Writer only improves my blogging habits. It is really a quality piece of software. Way to go Microsoft. I will admit, I am a little excited about this. In the latest episode of Rocketboom (June 20, 2007), right at the very end, they snuck in the fact they have a Facebook app. Basically, it is just a player that displays the shows and you can cycle back through old episodes. It is really simple, but I'll probably try and watch it on there from now on. One of the best things about Rocketboom (and new media in general compared to old media) is the number of ways you can watch it. You have the web site, YouTube (and other similar service), iTunes, and now even Facebook! It is really impressive how wide spread the episodes are. They probably spend quite a while propagating each episode to all of the different services. The quality looked nice in the player, although it takes a little longer to load than some others. I did like the quality of video that Democracy provided. I was watching my Video podcasts with iTunes but it decided it would rather blue-screen over playing content. As of when I installed the application, it had only 85 users and appeared to be an underground app. This means it was not yet in the catalogue of applications that have the partial Facebook seal of approval. Google Street Viewer (http://maps.google.com) has been available for a while. As soon as it was released it became a race to see who could find the funniest and interesting pictures. Most of which were quickly posted to Digg.The problem with using Street viewer is that there is just so much data out there. While they only have a few major cities covered at the moment, they still have a huge area covered. I was just listening to TWiT episode 101 and they were talking about a blog that summarizes the funny sightings found on Street Viewer. Sticking with the Web 2.0 theme it is named streetviewr. streetviewr is an interesting and well made site. Basically, it lists the different sightings on Street Viewer and lets you view them without leaving using Google's API or you can go directly into Google Maps. I saw a link on blogger about Windows Live Writer and I thought I would give it a try. It seems to be interesting. It is a strange cross between a web editing tool like FrontPage and a typical AJAX like text editor. I'll be blogging with this software for a while and when I get around to it I'll write something about how it is to use. First Impressions are good. It is not that I disliked the blogger interface, it is just that a more powerful (and even offline) too is more attractive to me. Plus, the preview feature on this that inserts the post like it was actually posted to your blog is really awesome. I have a feeling that I'll be playing with Drupal here in the next few weeks if I have the time. I'm excited I'll be getting my hands back on some PHP code. I also might dabble in the Facebook developers environment some if I get the time. Drupal looks like a good system. Actually TWiT uses it. That is where I first hear of it. My main concern in using it would be the ability to make some rather crazy custom code work smoothly with it. We'll just have to see how it works out. I've talked about this before, but I am not a huge fan of how the Facebook Notes importer works. Basically it was reading my Feedburner RSS feed and it stopped working for an extended period of time. I decided it was probably best if I moved it over to the direct RSS feed and I just spent the past 5 minutes sorting through duplicate entries that were double imported into Facebook. Hopefully they improve the functionality, but I don't see that happening now that the application platform is so important. I really do like having my blog imported because I think that is how some of my friends read it. I really wish they would add a ping button because it is frustrating having to wait for something magical to happen of Facebook's servers for a blog post to suddenly appear in the notes. Yay, I'm quite proud of my results! I'll join the bandwagon in talking about the release of the Safari browser on the Windows platform. I have to admit, when I read about it on Engadget's live coverage post I was fairly excited. I didn't rush to download it immediately because, honestly, I didn't realize it was going to be available immediately. I assumed it was going to be released in the coming month. I proceeded to download the application, which for the internet connection speed at my university seemed to take forever. I haven't really played with it very much, but it does look nice. It is hard to pin point but there is just a shiny newness to the browser. Text and images just have a polish that is not there in Firefox or IE. I honestly haven't used Safari for much browsing. I did post a blog entry from it and the first thing I noticed is there was no built in spell check. I am completely reliant on Firefox's spell check. Most people boil the browser market down to IE and Firefox. I actually have Opera installed as well and will use it from time to time. However, my trusty fall back has been Firefox. I really WANT to find another better browser, but I just can't find it. I think it is a result of the the add-ons that are available for Firefox. These shape my browsing habits more than anything else. I actually really like the Speed Dial feature in Opera. One of the complaints about the Safari browser as of yet was the amount of RAM it consumes. I'd like to point out the fact Firefox isn't very small itself. Currently I have 13 tabs open (maybe a little more than average) and Firefox is consuming about 250 MB of RAM! Needless to say I am glad I have 2 GB of RAM. Apple claims that it is faster than other browsers but I haven't used it enough to judge this for myself. I doubt I am going to move away from Firefox any time soon. It is reliable and the add-on selection is unmatched by any other browser. However, I believe that having more browser options is only good for the market and will result in a better product for the consumer. In the end, I now have 4 options for web browsers. That is more than I had a few days ago. I've just finished watching all six movies. Granted, it took two weeks to squeeze them into my schedule, but I've just finished watching the third movie today. I can't say that I have a favorite one yet but of the last six I liked the 4th the most. Of the first three I wanted to watch the third the most (knowing it linked together the two halves of the Star Wars universe). However, that doesn't mean it was my favorite. My favorite character, without a doubt, is Yoda. I don't understand why everyone hated Jar Jar so much. He wasn't that annoying. The one thing that has been cleared up by watching the movies, it was actually the fifth movie where I finally understood, is why a Yoda Backpack was so awesome. I knew that I would have to watch them all at some time in my life. I guess it is good that I managed to watch them all in such a short period of time. I'm going to end this now. 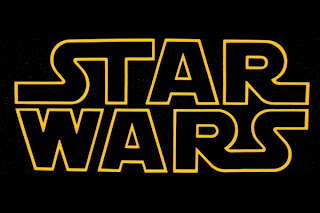 I fear that if I talk for too long I may become like so many others and become obsessed with the lure of the Star Wars universe. I just wanted to post that the Speed News Blog that I just started is now up and running. It even has the first few articles posted and more are to come very soon. I'm going to have my first edition of the paper published this weekend. This is going to take a large chunk out of my time so I'll probably be posting on my personal blog a little less. I posted a link to the blog below. I have been subtly influenced to post again about Tablet PCs. This time I'll focus on how I organize my files and how I make sure that I don't lose those very important class files that are on my tablet. How do I keep myself organize? I have several pieces of software that I have to use in order to keep all of my files organized so that I can efficiently function during class and while I do my homework. During class I use OneNote 2007 to take notes and during EAC 201 I use DyKnow to get the class notes. I use Outlook 2003 for my calendar and tasks (although I don't use it for any email). For keeping track of my grades I use Excel. I use other office products for classwork (Word, PowerPoint) when appropriate, but normally not during class. Lastly, I use Windows Journal when I want to do homework in digital ink. From this point, I change the way I organize files based on the individual class. For EAC 201, we use DyKnow, so I have to save these files in a sub-folder named DyKnow. I also create additional sub-folders in the DyKnow folder for each unit so they are ever further separated. This may seem a little excessive, but I do it just to be on the safe side. For my physics classes, I do my homework on my tablet so I have a folder named Homework. Since I scan most important documents from class into my computer I use a folder named Scans which keeps them together. Another case where I use folders is for my CECS classes where I need to keep program files for homework, labs, and lecture's organized. In this case I make additional sub-folders to divide lab dates and chapters or units. Having an organized hierarchy of folders is only part of getting organized. Naming files is important so they can be located quickly. This is more important under Vista than XP because of Vista's wonderful search feature. I recommend putting the course number in the file name as a prefix followed by the descriptive filename. For example my physics 299 chapter 22 homework would be named PHYS 299 - Chapter 22 Homework. Under Vista, if I want to open this file all I type is "PHYS 299 22" or even "299 22" and the file will appear! Not only are the files important, but having them in a useful form is important. I keep all of my class syllabuses and other class documents in OneNote. I do this by using the OneNote 2007 printer. Basically, I go to file print from any application and print to OneNote where I can keep my important class documents. These files normally come from scans, PDF files, and Word or PowerPoint documents. As for organizing OneNote, it is nearly identical to the way I organize my files. I use a notebook for each semester, a large division for each class, and one section for the class in general (used for the syllabus and other important things) and an additional section for each unit in the class. This results in almost two identical file structures but keeping them separated is not that big of a deal. Using OneNote is more of a preference. It would be possible to use a notebook for each individual class. The best part about having notes in OneNote 2007 is the fact they are highly searchable. This is the main benefit of using a tablet PC to take notes in class. Being comfortable using OneNote is by far the most important thing to learn about using a tablet as a student. As for keeping a schedule organized, I use Outlook 2003. The only reason I don't use Outlook 2007 is because the university will start distributing it to students July 1. I put all of my classes into the calendar. While this may seem redundant, classes are canceled, rescheduled, and sometimes moved. Also, with all of my classes in Outlook it is easier to squeeze meetings into my day. The reminders are useful but I don't rely on them very heavily. The tasks feature is how I keep track of all of my homework. After I receive my syllabuses for each class I immediately type in every test, quiz, and homework. I tend to rely on the Next Seven Days view in order to know what needs to be done in the coming week. The only major problem is when professors do not assign homework until right before it is due. This requires quite a bit of work keeping up with my tasks, but it helps me stay organized. Between my school files, OneNote, and Outlook I have over 2GB of files just for class! These files are extremely important and at any given time I will have a handful that will be absolutely devastating if I lost. This is normally a project or my class notes right before a test. I can't emphasize enough how important it is to back up your files. I've lost many files due to hardware failure before I came to college, and I was determined to be backed up at all times. Since internet is available almost everywhere on campus and is extreamly fast, online backup services are perfect. The one I selected to use was Carbonite (I earlier blogged about Carbonite in my post Software: Carbonite) It costs about $50 a year for unlimited backup. It is basically set it and forget it. Only 10 minutes after I make a file it is backed up to an online server. They update the file every 24 hours. This all happens automatically without any user intervention. Theoretically, if my laptop batter were to explode I wouldn't lose a single file. While not having my laptop in class would be very difficult, having all my files disappear would be even worse. I spent all this time organizing my files I don't want them to disappear when my hard drive fails. I can't resist, I have to post a response to the blog entry Travis just posted. First I suggested that he blog about it (the freshman game night for orientation) and suddenly he replies to my my Facebook wall where I suggested it post saying he already did. I hope we can resolve this issue so that the freshmen never knew it even came up. Awesome! That was such a one two punch. However, when he moved on to the second person, he wasn't as slick with the words. Overall the game night was amazing. The networking with the freshmen went awesome. It's late so I'll cut this post short even though I probably have more to say about the subject. Billy Gates was on the Today Show this morning showing off his fancy new table. Want to see it in action rather than just in photos? Check the video for all sorts of goodness of it being used for all sorts of applications, such as playing with photos, wirelessly pulling photos off a camera, and ordering and paying for food using credit cards. I thought it seemed appropriate that I post at least a small bit about me becoming the new Speed News Editor. I just stepped into the position and am working frantically to get out my first edition. It is definitely going to be a lot of work but I think I am up to the challenge. One of my first orders of business is getting a WordPress installed on the school's server. I do note the irony because I use Blogger for my personal blog. The website for Speed School Student Council will have copies posted of each edition I release. Also, I plan to use the blog to post smaller articles (more frequently). One of the first orders of business is to get some information about Tablet PCs from the prospective of students posted. Good thing this is being imported into Facebook because I have a request for those who I tagged in this message and anyone else who may have a tablet who I forgot to tag or is not my friend on Facebook. If you could get some type of write up, just a few paragraphs, about how you use a tablet, problems you faced, and general tips. It would be nice to have this from as many people as possible so they could all be posted on the website (which doesn't exist yet) to help those incoming freshman. It would be nice to have what exact tablet you have, what classes you have used it in, and just any other information you think would be helpful. There is no rush but it would be great if any of you could contact me and tell me if you will be able to do this. I'll post more information once things start falling into place. One of my goals is to increase the online aspect of Speed News and if anyone has any suggestions it would be awesome if they could send them to me. I found this on WiiArcade (a great website for flash based games that work on the Wii browser). Dicewars is basically a simple version of Risk. 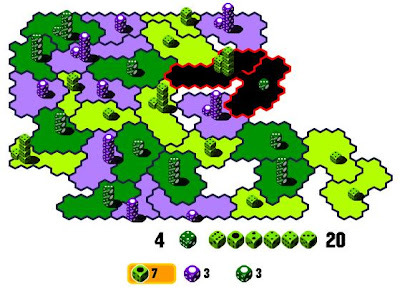 The concept is that a map is randomly generated and then dice are placed on the board. You get to pick your number of enemies (between 2 and 8 total players). However, this is only a single human player game. 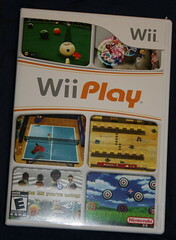 The game play is very simple and mostly automated. Basically, you select one of your piles of dice and attack a neighbor. The two piles roll all of the dice (the piles are capped at 8) and if the attacking player has a higher number they get the property and move all of their dice (except one) into the land they conquered. It is typicall not a smart move to attack a pile that is larger than yours. Equal piles are a little under half the odds but smaller piles are almost always a good bet of winning. After a player ends his turn they get additional dice equal to the number of connected properties they have. This results in several different strategies. The most important aspect of the game is to connect all of your properties each and every turn. It would probably also be important to note that you play as the purple/blue player (depending on your screen). The strategy I typically use is to try and be aggressive enough to take the best area of land, typically a corner or long strait, and then defend my borders. I do this by paying attention to where I attack to form the fewest number of enemies until I build up enough forces. Also, I typically try to avoid enemies who are much more powerful. It is not a good decision to attack a area, even if it is an easy win if you will "invite" the enemy to attack land that you need to help reinforce. I'll also note that the above is a picture, not the actual game if I confuse anyone.